Prime Minister Manmohan Singh today told Parliament that discussions were on between Iran and Russia on the issue of Iranian nuclear programme and his government was hopeful that “solutions acceptable to all sides will be found.” He also made it clear that India was not part of any design to topple the regime in Iran. Cine-star and Rajya Sabha member Jaya Bachchan has been disqualified by the Election Commission as Member of Parliament for holding office of profit as Chairperson of the Uttar Pradesh Film Development Corporation. Should the doctors resorting to strikes be sacked? The Delhi Police today registered a new case in the Jessica Lal murder case under various sections of the IPC following public outrage after a local court acquitted all nine accused, including Manu Sharma, son of Haryana minister Venod Sharma. 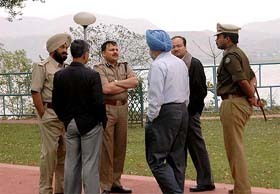 A high-level meeting between senior officers of the police and the administration of Punjab and Himachal Pradesh was held at Nehru Sadan in Nangal today to ease tension between the truck operators of Nangal and Bilaspur. Senior officials from Punjab and Himachal Pradesh discuss the situation arising out of the Nangal and Bilaspur truck union dispute at Nehru Sadan Rest House, Nangal, on Monday. A day after he threatened to take to streets in protest against the removal of the name of his father from that of the Panipat thermal plant, former Chief Minister Om Prakash Chautala flew out of the country. The President, Mr A.P.J. Abdul Kalam, is learnt to have cleared seven names for appointment as Judges of the Punjab and Haryana High Court. 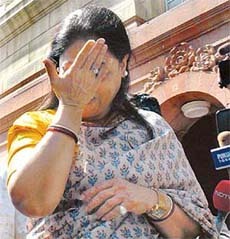 All seven are practising lawyers and their names had been recommended by the High Court collegium in November 2005.